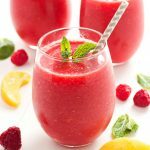 This Raspberry Peach Green Tea Smoothie is a delicious low-calorie treat that makes a great healthy breakfast or snack! Add the banana, frozen raspberries, frozen peach slices and cold unsweetened green tea to your blender and blend on high speed until smooth! Serve with some fresh mint leaves as a garnish (optional) and a cute paper straw.